The Memorial Foundation of the Germanna Colonies in Virginia, Inc., met with Apollo 11 astronaut and Germanna descendant Buzz Aldrin at the Germanna Community College’s Daniel Technology Center in Culpeper on Friday, November 7th, as he met with students as part of his ShareSpace Foundation’s effort to inspire children to study science, technology, engineering, the arts and mathematics. Buzz is descended from the Germanna colonial Haeger, Rector and Fishback families. The Germanna Foundation helped establish Germanna Community College by donating the land for the Locust Grove campus to the Commonwealth of Virginia for the purpose of founding the College in 1969 – the same year that Buzz walked on the moon. About the Germanna Foundation: The Germanna Foundation is a nonprofit 501(c)(3) organization with a mission to preserve the early German-American heritage that began in colonial Virginia through lively programs of: (1) Land conservation; (2) Preservation of historic structures, sites, and cemeteries; (3) Education of the general public as well as the tens of thousands of descendants of those early settlers; and (4) Development of strong international relations with counterparts in Germany. Click on photos to enlarge. Also see them here. Marc Wheat tells Buzz Aldrin about his Germanna ancestry. Aldrin was very taken with the gift. 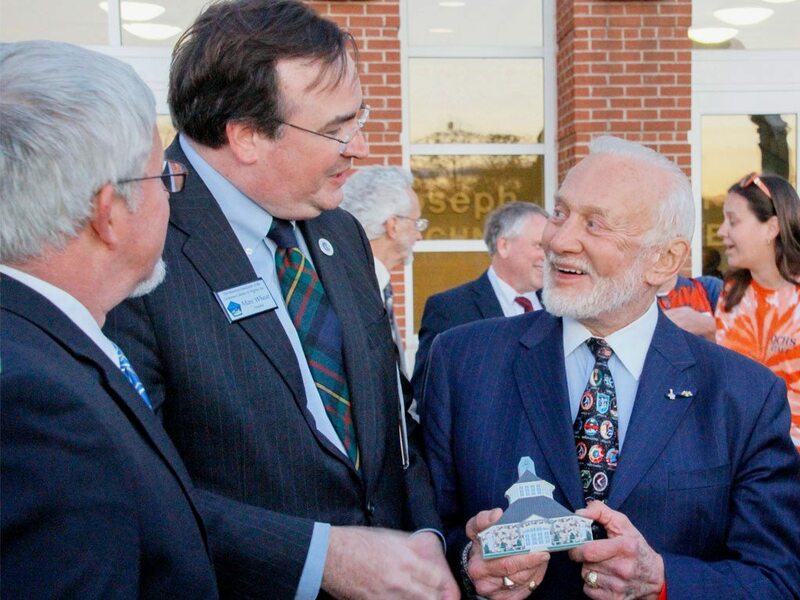 Germanna Chief Operating Officer Steven Hein, Marc Wheat, Buzz Aldrin and behind him, Germanna Community College President Dr.David A. Sam. The Germanna Delegation: Keith Hoffman, Mary White, Marc Wheat and Steve Hein. Note what he is proudly holding!